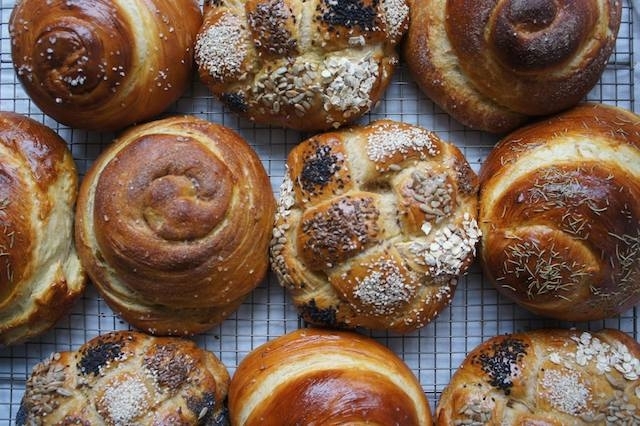 The braided challah, which is made with eggs, is the Jewish Sabbath‑and‑holiday bread. It is surrounded by folklore and tradition and loaded with symbolism. On festive occasions a blessing is said over two loaves, symbolizing the two portions of the manna that was distributed on Fridays to the children of Israel during their Exodus from Egypt. The breads are covered on the table by a decorative challah cover or a white napkin, which represents the dew that collected on the manna in the morning. 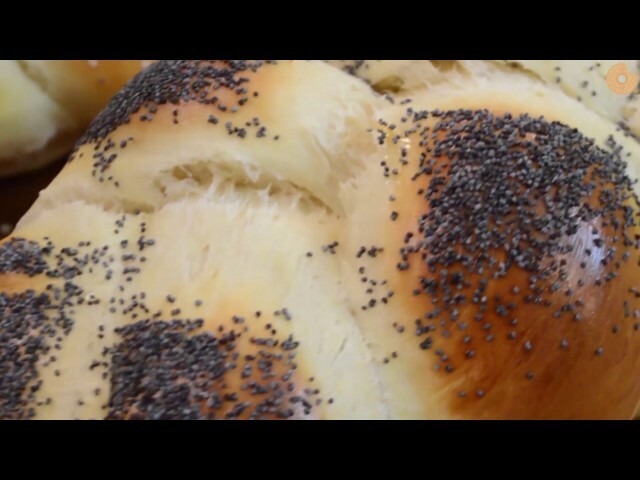 Poppy and sesame seeds sprinkled on the bread also symbolize the manna that fell from heaven. Challah is made in various sizes and shapes, all of which have a meaning. Braided ones, which may have three, four, or six strands, are the most common, and because they look like arms intertwined, symbolize love. Three braids symbolize truth, peace, and justice. Twelve humps from two small or one large braided bread recall the miracle of the 12 loaves for the 12 tribes of Israel. Round loaves, where there is no beginning and no end, are baked for Rosh Hashanah to symbolize continuity. Ladder and hand shapes are served at the meal before the fast of Yom Kippur, the ladder signifying that we should ascend to great heights, the hand that we may be inscribed for a good year. On Purim, small triangular loaves symbolize Haman’s ears; at Shavuot, two oblongs side by side represent the Tablets of the Law (the 10 commandments). The bulkah is a segmented rectangular challah. Sweet challahs with honey or raisins are baked during the festive season to bring joy and happiness. The name challah is derived from the Hebrew word used for portion in the biblical commandment of the first of your dough you shall give unto the Lord a portion for a gift throughout your generations. Jews were biblically commanded to separate from their doughs one twenty‑fourth and give it to the kohanim (priests) every Sabbath. In post-Temple times the rabbis ordained that a challah (portion), which had to be at least the size of an olive, must be separated from the dough and burned. 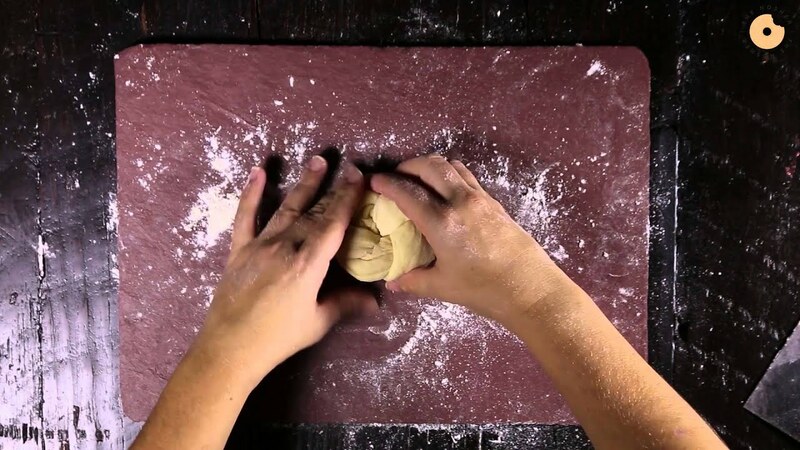 It is still a tradition for Jewish bakers and observant homemakers to tear a tiny lump of risen dough from any type of bread and to burn it (usually wrapped in foil) in the oven or fire while making a blessing. The name challah was given to a bread in South Germany in the Middle Ages, when it was adopted by Jews for the Sabbath. It was the traditional local Sunday loaf, and its various shapes and designs were in the local tradition of decorative breads. John Cooper in Eat and Be Satisfied: A Social History of Jewish Food notes that the first mention of the bread was in the 15th century and that the term was coined in Austria. Before that the bread was called berches, a name that is still used by Jews in some parts today. The bread became the Jewish ritual bread in Germany, Austria, and Bohemia and was taken to Poland, Eastern Europe, and Russia when the Jews migrated east. Housewives kneaded the dough on Thursday, let it rise overnight, and got up early on Friday to bake it. They often baked all the bread for the week at the same time, so as not to waste fuel. The distinctive smell that emanates from the oven and fills the house when it is baked is the Sabbath aroma that pervades the memories of the old Yiddish‑speaking world. Ask the Expert: For Shabbat, Can I Use a Different Type of Bread Instead of Challah? What works for saying the blessings and "taking challah"?